Welcome to the Americas Best Value Inn & Suites of Flagstaff, AZ. We are centrally located on historic Route 66 near many local attractions and businesses, making this the ideal spot for corporate and leisure travelers. 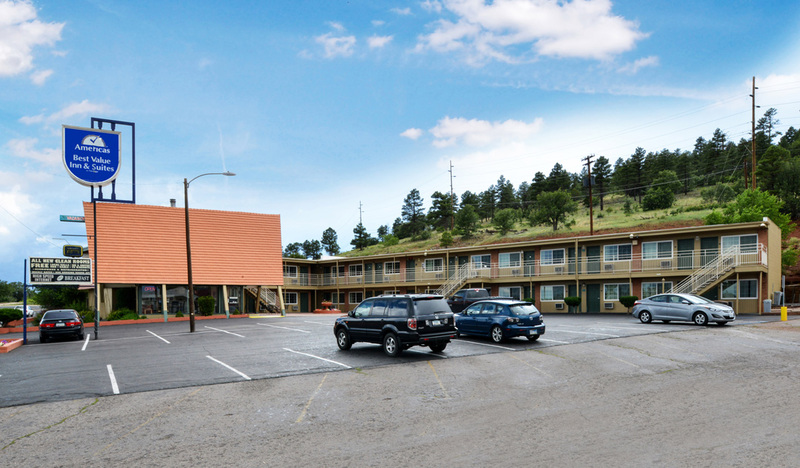 Our 2-story exterior design hotel offers clean and comfortable non-smoking guest rooms with breathtaking views of the largest Ponderosa Pine Tree Forest in the world. All rooms are furnished with Hi-Speed Wireless Internet Access, Microwave and Mini-fridge, Cable TV with HBO, Complimentary Local Calls, and Wakeup Call Service. Fax and Copy services are also available. Pets are welcome for a nightly charge of $10 per pet per night up to 10 lbs and $20 for pets over 10 lbs. Start your day right with our complimentary continental breakfast which includes coffee, juice, danishes, muffins, and bread. Our courteous and experienced staff is always eager to make your stay with us a memorable experience. Enjoy the value of staying with Americas Best Value Inn. Check out these Flagstaff attractions during your stay. Flagstaff Symphony Orchestra, 2 mi. Grand Canyon Railway, 2 mi. The Arboretum at Flagstaff, 4 mi. Youngs Canyon Dam, 12 mi. Sunset Crater Volcano National Monument, 15 mi. Red Rock State Park-Sedona, 25 mi. Montezuma Castle National Monument, 45 mi. Verde Canyon Railway, 45 mi. Grand Canyon National Park, 74 mi.